So – God is knowable. And He wants you to get to know Him, personally, for yourself. That’s the first thing. The second thing is this: God knows YOU, personally and individually. You are not distant from, unknown to, or forgotten by God; You are remembered & personally known to Him. He holds you very close in His heart. Here’s the third thing: Get to know God NOW, as early as you can. Don’t wait until you are an adult to get to know God personally, for yourself. 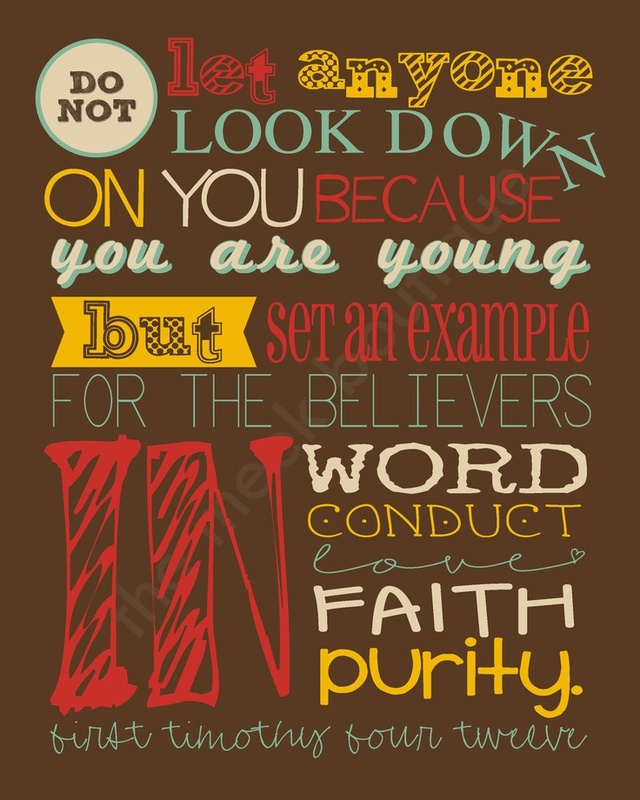 Don’t wait until you are an adult to become a passionate and fully-devoted follower of Jesus! You don’t have to wait! Teenager: you can do that right now, at age 12, 14, 17! You don’t have to wait until you move out of your parents’ house to get to know Jesus on a very personal level, until you commit your entire life to loving Him and living for Him. Don’t wait! 1 Samuel 13:13-14 – David was called (by God) “a man after My own heart” at about age 15! Genesis 39-41 – Joseph responded to those horrible injustices and temptations in his life – with grace & maturity & Godly character – between the ages of 17-30, with the worst of his injustices coming between the ages of 17-22! If you read Jeremiah 1, most scholars agree that Jeremiah was probably in his mid-to-late teens when God called him to be His prophet to the kingdom of Judah. How old was the boy in John 6 who gave his little lunch to Jesus so that Jesus could multiply it and feed 5,000 families? He was probably 8-10 years old! How old was Samuel when he learned to recognize & respond to God’s voice in 1 Samuel 3? He was probably about 10-12 years old! How old were the first 4 disciples that Jesus called to follow after Him? How old were these 4 guys? they were 2 sets of brothers, fishing with their Dads. They are apprentices to their fathers’ fishing businesses! they’re just teenagers, maybe 15-18 years old! Another clue to this is that Jesus was a Rabbi, and in that culture and time, rabbis usually chose disciples who were in their mid-teens. So, think about this: if Simon was 15-18 when Jesus called Him to be His disciple, how long did Simon follow Jesus? So 3 years later, how old would Simon have been? 3 years later, when Jesus looked at Simon (in Matthew 16:17-18) and said, “You are no longer Simon, I say today that your name is Peter, which means Rock, and upon this Rock, I will build My Church”, it is likely that Peter was only about 18-21 years old. So where has this young man Simon Peter been for the past 3 years? What has he been doing between his mid-to-late teen years? He’s been walking with Jesus. He’s been walking with Jesus! Everyday, walking with, and getting to know, and learning from, His Lord and God, Jesus. 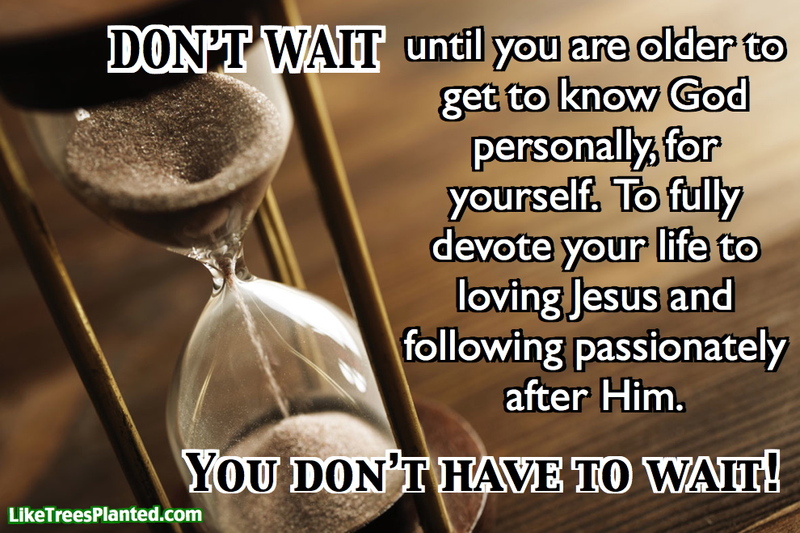 Don’t wait until you are an adult to fully commit your life to loving Jesus and following after Him. These teenage years are some of the most valuable years of your life. And from all these examples I just gave you from the Bible, it is obvious that God cares about teenagers, that God believes in teenagers, that God wants to fill you, and empower you, and employ you to be a great and mighty demonstration of His love and character to the world. Don’t wait! Don’t wait. Don’t squander these precious years of your life waiting to become an adult so that you can then fully follow after God. START RIGHT NOW. How do you do that? I’m glad you asked! That will be the subject of the next post in this series!